The Center for Disease Control reports that the incidence of autism is now 1 in every 68 children. 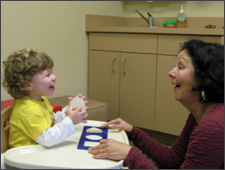 Research shows that early identification and early intervention is the most effective way to address developmental delays. The Early Identification page of the California Making Access Possible (MAP) for Inclusion & Belonging website was developed in collaboration with the Center for Disease Control (CDC) Learn the Signs Act Early (LTSAE) Grant partners in California. 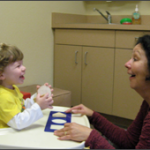 The goal of the grant, implemented in 2013, was to promote distribution of the free CDC materials on developmental milestones to aid families, early care and education providers, early interventionists, home visitors, health care providers and others in identifying the early signs of a developmental delay. To summarize the key components of early identification, the LTSE grant partners created a three-page Early Identification Guide. The Guide shows a color-coded graphic with the key components of early identification that match more detailed explanations on a flow chart that follows on the next two pages. The key components include (1) “Developmental Education and Observation” referring to the need for families and service providers to understand and observe developmental milestones (2) “Developmental Screening,” which identifies potential “Developmental Concerns” through validated screening tools and describes next steps depending on the results of the screening (3) “Community Resources and Supports” that help families connect to the services their children need when “Developmental Concerns” are identified through screening. The Early Identification web page categorizes information and web links by topic to provide a well-rounded set of resources to support families and providers to “Act Early” to address concerns. Healthy Development: Videos and resources tailored to specific audiences that provide educational resources on developmental milestones and early identification. Working with Families: Resources for building relationships with families. When Concerns Arise: “How To” educational tools for talking with families about developmental concerns identified by a service provider or screening tool. Developmental Screening: Resources describing the screening process and recommended screening tools from both the CDC and the new federal initiative, Birth to 5: Help Me Thrive. Referral for Evaluation and Assessment: How to make a referral for evaluation and assessment and the agencies that provide evaluation and assessment. Community Resources/Support for Families: Resources and links to organizations and agencies that support families of children with identified disabilities, with developmental concerns or who are at risk for developmental concerns. For more information and to sign up for their mailing list, visit the California MAP to Inclusion & Belonging website. Cindy Arstein-Kerslake has worked as a research and evaluation consultant in the field of early intervention and early mental health for the past 12 years. She currently works with WestEd’s Center for Child and Family Studies on the MAP* to Inclusion & Belonging (Making Access Possible) project. This entry was posted in Early Identification, Guest Blogs, Home. Bookmark the permalink. Trackbacks are closed, but you can post a comment.